Without a doubt, unless you are planning on buying a couple of hundred chairs and a ginormous marquess to live your happy-ever-after in, rentals save the day when it comes to weddings. Nowadays, with such an eclectic and high quality selection of availables out there, it is a joy to be able to select what works best. With our help, you should be able to find a reputable, reliable vendor who will deliver, set up, take down and remove the goods in a timely way. Rentals can include tents, P A Systems, other equipment (from catering trucks to hot plates to barbecues), flooring and staging, foam machines, laser light shows, oxygen bars, portable bathrooms for those outdoor weddings or those in remote, exclusive areas, tables and chairs, tableware and tents. The logistics of renting may put many off but these are professional companies and often the prices slash those of fully-equipped venues. You have a better chance of custom-fitting your own wedding. 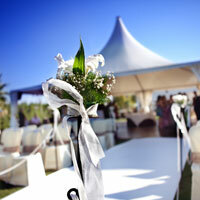 Vast ideas for rentals that can transform your wedding from the mediocre to the wow!